Exercise and physical activity is very good for health and well-being. 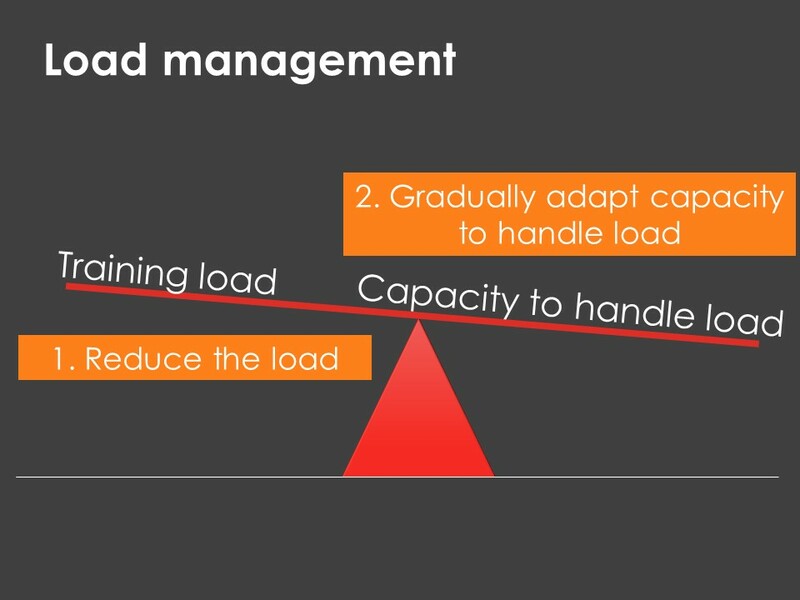 However, poor load management (‘too much, too soon’ or ‘too little, too late’) may be a key reason to the development or delayed recovery of musculoskeletal injuries. If you are not sensible with how much exercise your patient does, other normally effective treatments may not actually end up helping. That’s why managing load is very important. Take a look at the short video below to get some tips on how you can manage exercise and physical activity loads. Irritability: the degree which symptoms increase and subsequently decrease with an aggravating movement/posture and is time-related. If symptoms cease immediately, then the symptom is deemed non-irritable. What activities or positions aggravate the symptoms? How long does it take while completing that activity or position before symptoms start? If the activity is stopped or the position is changed, will the symptoms continue to progress? How long do symptoms last before returning to baseline after the activity or posture? What can be done to reduce symptoms? It aims to provide guidance for exercise prescription to ensure under-loading or over-loading of tissues is minimised during rehabilitation. It is concerned with the progressive manipulation of dosing including magnitude, variation and direction of load that is applied to a tissue that maximises its physiological adaptations, while maintaining high quality movement (Glasgow, Phillips, & Bleakley, 2015). It is dependent on tissue type, presenting complaint and the adaptation required for performance. Providing variations in magnitude, direction and rate of loading may prevent repetitive overload and modifications of direction of load, including compressive, tensile and torsional, allowing tissues to resist a range of loading types. 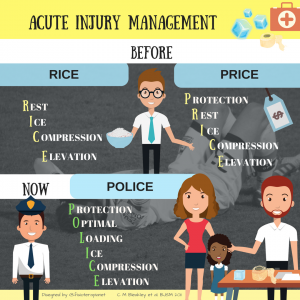 In the early stages of a musculoskeletal injury, we have traditionally been encouraged to adopt the RICE principle – Rest, Ice, Compression and Elevation. However, more recently, encouragement to allow and monitor load on injured tissues in the early stages following injury has been encouraged, adopting the POLICE principle – Protect, Optimise loading, Ice, Compression, Elevation. This means exercise targeted to gentle loading of injured tissues may be appropriate. The acute:chronic workload ratio is a calculation that compares short-term and long-term workloads. 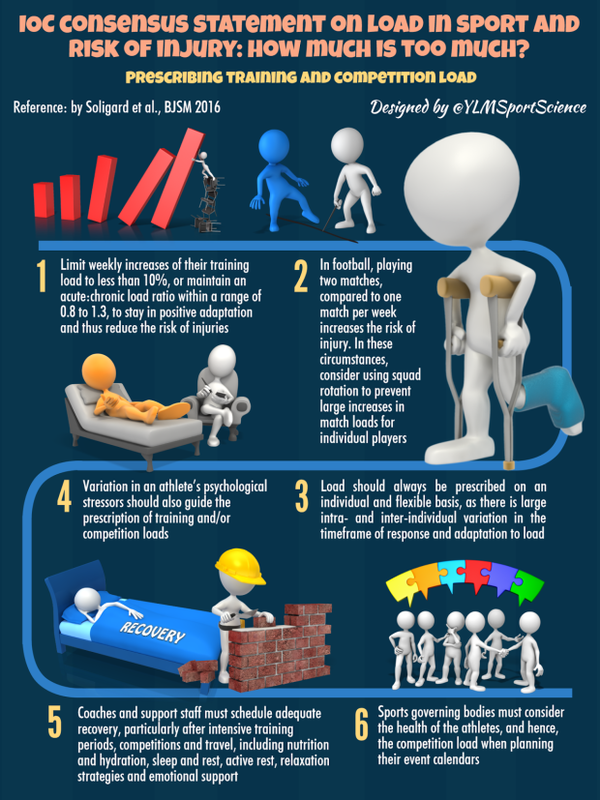 Studies must consider the effect of the accumulation of load to fully understand the relationship between injury and workload. Previous studies examining the relationship between workload and performance have assessed the absolute 1 week workload (acute workload) relative to 4-week chronic workload (4-week average acute work- load). “The acute:chronic workload ratio (ACWR) is a model that provides an index of athlete preparedness. It takes into account the current workload ( acute; rolling 7-day workload) and the workload that an athlete has been prepared for ( chronic, rolling 28-day workload).” (Murray et al, 2017). The actual value presented by the acute: chronic workload ratio has different implications, and can assist practitioners in understanding the preparedness of an athlete, the relative injury risk of an athlete from day-to-day, and therefore, with carefully planned intervention, can help to prevent injury. The assessment of the A:C workload ratio, for high and low chronic loads, may provide a more comprehensive prediction of injury risk than absolute workload alone. Evidence of this has been recently demonstrated in A-League football, where metres per minute in the 1 and 4 weeks prior to injury were significantly higher than the seasonal average (Ehrmann et al, 2016). The assumption of a pure structural and biomechanical explanation for the etiology of many musculoskeletal conditions have been questioned to the detriment of one in which biologic factors are being given more consideration. Interestingly, a pathophysiologic process, often caused by simple overload, might best account for the etiology of some musculoskeletal conditions in most patients. It is represented by a diagrammatic representation of the zone of tissue homeostasis proposed by Dye 2005. A single loading event of sufficient magnitude or a series of repetitive loading events of a lesser magnitude can cause an injury inducing a cascade of reparative biochemical processes which reflect a loss, at least temporarily, of normal tissue homeostasis (maintenance of constant conditions in the internal environment). Dye, S., 2005. 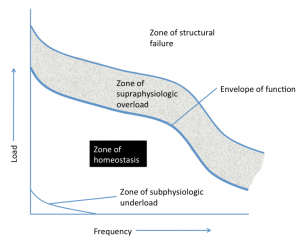 The pathophysiology of patellofemoral pain: a tissue homeostasis perspective. Clinical Orthopaedics and Related Research, (436):100-10. Gabbett, T., 2016. The training—injury prevention paradox: should athletes be training smarter and harder?.British Journal of Sports Medicine, 50(5), pp.273-280. Bowen, L., Gross, A.S., Gimpel, M., & Li, F. X. (2017). 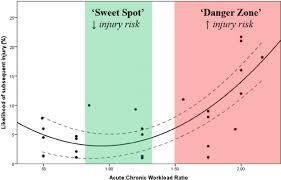 Accumulated workloads and the acute:chronic workload ratio relate to injury risk in elite youth football players. British Journal of Sports Medicine. 51:452-459. Ehrmann, F. E., Duncan, C.S., Sindhusake. D., Franzsen W.N., & Greene, D.A (2016) GPS and injury prevention in professional soccer. Journal of Strength & Conditioning Res. 30:360–7.